Swing-arm Lamp with a ventilated 6 1/2" diameter metal shade with K/D reflector. Spring-balanced arms and knob to secure in any position. Arm height adjusts to a 32" maximum. Shade adjusts 6 1/2". Four-way mounting clamp. Takes a 100W bulb (not included). 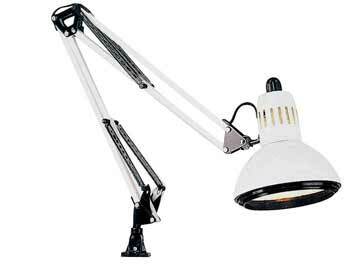 Heavy duty model, 45" reach. 21 points will be rewarded when you are logged in to your account and buy this item.